The winds howled across the western Cathayan deserts as Miraguel's last warriors disembarked upon the sandy shores. The mountains of mourn appeared as a mirage in the distance..
"We're off course my Lord, 300 leagues by the corsairs reckoning, close to Ogre country. What should I advise our captains?" Miraguel sighed, this voyage had turned out to be more problematic than he'd anticipated. "We can go no further in this storm, and we'll need to repair the ship, Czdaellia has sent her familiar to scout, and reports an oasis not far inland. we can use the wood and water we find. We move in the morning." "As you wish my lord.."
Boglab, sat upon the dune, as he watched the trappers return. He grinned toothily as a large shudder erupted from beneath him, blowing out puffs of sand into the wind. "Hur hur hur! Da best one yet! "Now, lets see what those runtz have lernt about dem big pointy ships"
Fizzywig Bottlecrack shuffled forward, and fell on his knee's in front of the massive Ogre, one of Tyrant Grimgot Bellyflab's chief lieutenants. "Ssire, We report sships..full of pointy ears..Mus' be about..(counting on his fingers, and giving up after 'one') a fousand of em! in black armour and theze wuman shaped wuns wiz all there bits owt!" "Good good! Canned food for later an' the rest'll go down quickly wiv no stringy clothes gettin' between me teef!" Fizzywig looked up at the ogres around him and plunged on. "Pigbog and his ladz stayed on in da Oasiz, to keep watch, What should we do O' flatulent one?" Flubbergut Bellyflab, Tribe butcher, leant over and whispered in his cousin's ear. "hurhur! dats right! never should march on an empty gut!" Boglab reached down and stuffed Fizzywig, headfirst, into his mouth, with a last squeak, Boglab swallowed. "So" he mumbled, licking his lips, " who's next?..." The shadow of the Ogres circling the trappers darkened..
Adam chose Fire and Dark lores for his mages, rolling Fireball & Conflagration of Doom and Chillwind & Word of Pain.. Lets see how they fare against Gut Magic..
With a lucky roll (6) I got the first turn , and made a general advance up the centre, while shuffling the Gnoblars forward. SHOOTING -The scraplauncher crew took aim and fired on the Crossbowmen but fell short by about 8" .. still can't guess range for love nor money! Trappers fling their sharp stuff at Shades, but fail spectacularly. MAGIC - Bangstick on the Riders on the left flank, killing 2. 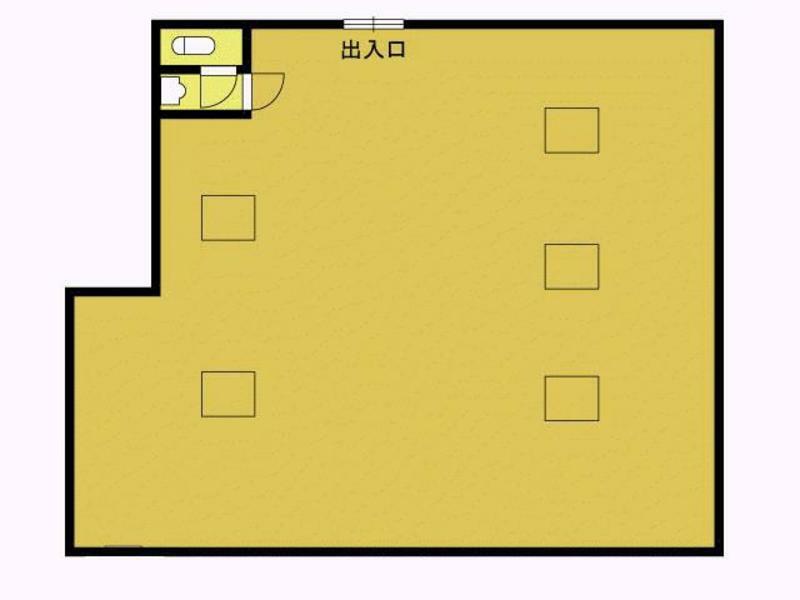 Panic test easily passed. Trollguts cast on Spleeny's unit, but taking a wound as a result. 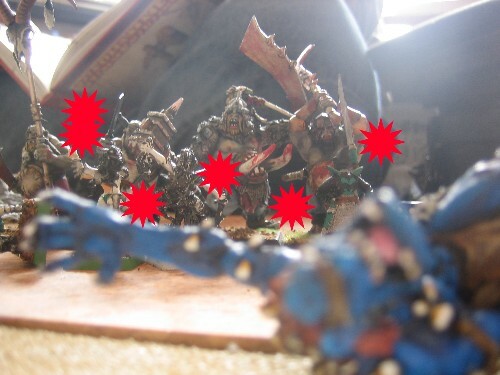 SHOOTING - The Shades' attention drawn to the leering gnoblars return fire, but only succeeding marginally better taking down 1 lowly greenskin. The crossbow unit in the centre faired a little better unleashing a torrent of bolts into the advancing Bull's taking one down and forcing a panic test, which they pass. MAGIC - A fireball unleashed upon the remaining Bull's sees another fall, the remaining bull seeing his mates roasted and pincushioned digs in and vows revenge... Conflagration of doom is then cast on the Bruisers unit, causing 2 x s4 hits but failing to go any further, after the smoke cleared, the Ogres were left unscathed. All bicker tests passed. Mr Pink fails to arrive, and Leadbelchers fail to rally. 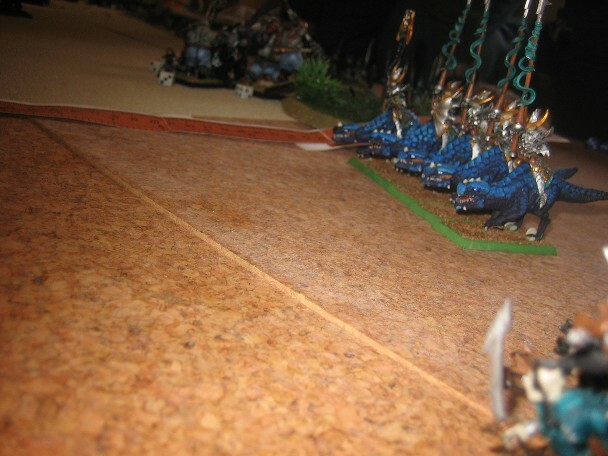 Both units of Ironguts declare charges on the riders, who opt to flee. The Riders in the centre clip the crossbowmen forcing a panic test, which they fail, and flee a few inches. The ineptitude of this unit grows. The Trappers have another pop at the Shades, and take 1 down. The leadbelchers on the right flank, having advanced just enough to see the spearmen hiding behind the oasis, unload their cannons killing 5. panic test passed. MAGIC - Bloodgruel cast on Sweeny, who regains a wound, Flubbergut kills 1 more Rider with Bonecracker. SHOOTING - Riders come around the oasis and take some pot shots at the Trappers killing 2, one shy of forcing a panic check. other riders shoot at the fighters killing 1. MAGIC - a complete blow out, 5 dice rolled for conflagration, burning only my dispel scroll instead. COMBAT - The leadbelchers lose and flee off the table, Hatred forces the shades to follow. First blood to the Dark Elves! Everything, EVERYTHING went wrong this turn! Trappers and Fighters both bickered.. Still no Mr.Pink (where is he?!) Leadbelchers fail again to rally ,now at about 4" from the edge! Bruiser attempts another charge, this time on the rallied crossbowmen, but falls short about 1/2" Spleeny's Ironguts again attempt to charge the Riders, who again flee. 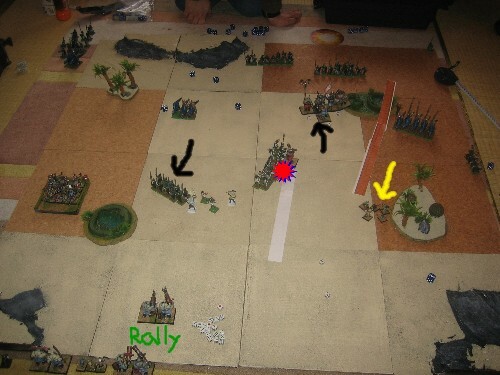 The lone bull turns to face the left to avoid a potential charge by the steadily approaching Witch Elves. Still can't get that charge in! fortunately it scatters out of harms way. With the gnoblars bickering and the general failing a charge, no more shooting. MAGIC - BAM! Spleeny Todd misfires! Vomiting blood and bone fragments over himself and his unit, causing S3 hits on all Ogres in contact with himself luckily Trollguts regen blocked any damage. Flubbergut however manages to get Trollguts on the general's unit. Riders successfully rally. Right flank Riders charge Trappers who opt to flee. The sneaky Harpies move around the back of Spleeny's unit, while the Corsairs charge into their flank, taking down 1 Irongut, combat resolution leaves them needing a 3 or less to hold, and of course they flee...straight into the Harpies. 350points gone! gulp! The corsairs then overrun. The Witch Elves, who, up til this point, have been wandering rather aimlessly, finally charge the lone bull. With nothing better to do, he Holds. 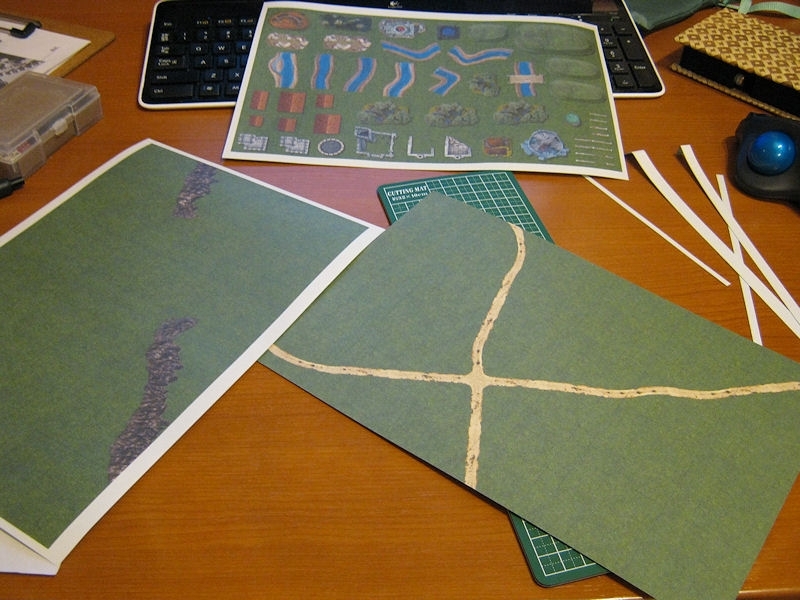 SHOOTING - Everything even remotely shooty aims at my only major threat on the table, the Generals unit. Butcher and Bruiser take a wound apiece, with 2 wound off the ironguts. They live! phew! that was close..
MAGIC - Chillwind succesfully cast on Generals unit. WS and BS reduced to 1 til next elf magic phase. OGRES - BIG FAT ZERO! Something drastic needs to be done. first off Trappers fail to rally, crap.. but not unexpected (LD 5) Leadbelchers finally rally, yahay! 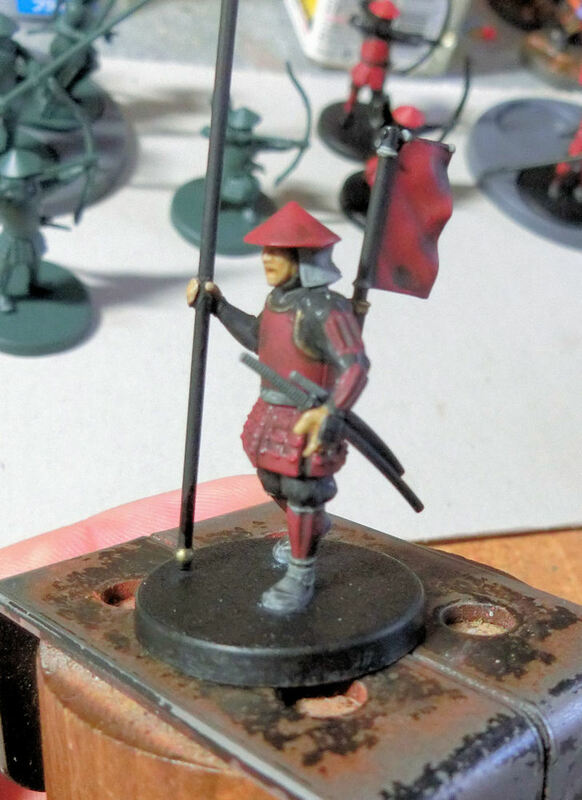 and Mr Pink turns up behind the crossbowmen. General Charges the Crossbowmen, Nowhere to run now! and challenges the Mage, who refuses and cowers behind her troops. A few blooddrenched moment later and theyre needing snake eyes to stay in the fight, they barely avoid running into Mr Pink, but are off the board by about half an inch, Phew! Boglab manages to hold his troops from following. BSB also gone! SHOOTING - Fighters lob sharp stuff at the 2 remaining Riders on the left flank killing both. Go Gnoblars! MAGIC - Butcher regens a wound. The Harpies charge the Leadbelchers, who stand and shoot, After a massive volley of 16 shots, all that was left was a slight red mist and a few feathers, revenge! Witch Elves reform to face the Bruisers unit. SHOOTING - Riders turn and shoot at long range at fighters killing 3. Shades charge trappers, who continue fleeing. Shades end up in the woods. Trappers fail to rally, Gorger charges Spearmen (just in range) who opt to flee, movinga full 12" away. Genreal turns his unit, to face the Witch Elves. 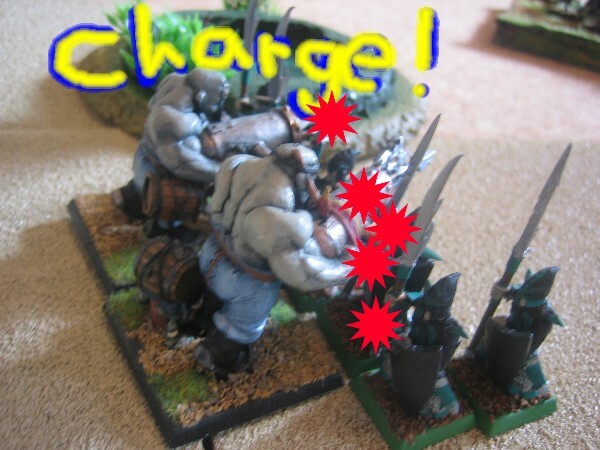 Leadbelchers, now wielding lighter cannons, opt to charge the Corsairs, who hold, receiving the bull charge, 1 dies to impact his and 3 more in combat. the corsairs fail to wound back, but the combat ends in a draw. SHOOTING - Scraplauncher misfires (again) bringing it to a total of 6 misfires in 3 games! A record? 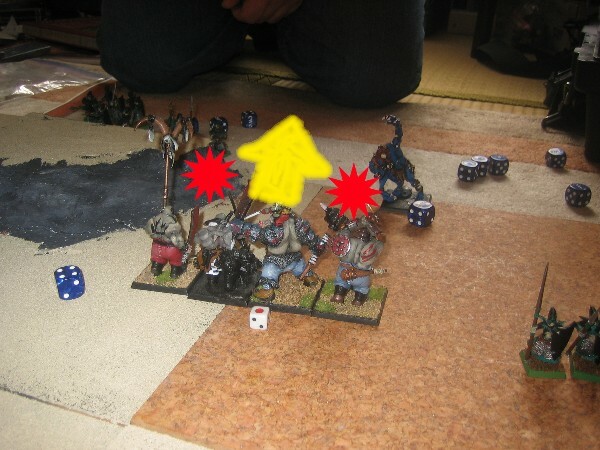 This time a hatchet flew into Fuzzball's rear end causing him to charge right off the board. doh! 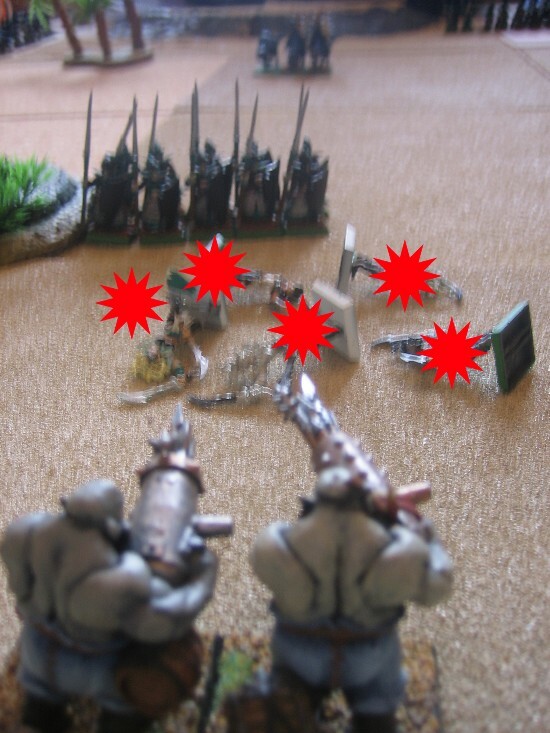 Boglob fires his handguns into the Riders killing 1, Fighters fail to wound the Witch Elves. MAGIC - Flubbergut casts bonecruncher on Riders Killing 3 more. 1 left... passes panic check. Bangstick dispelled. SHOOTING - 1 x Witch Elf shot down by Bruiser, 2 more from the fighter. MAGIC - Braingobbler cast on the Spearmen , Adam let it pass, saving his DD for the magic missiles, and trusting in the Dark elves high LD, rolls a double 6 and proceeds to flee off the table! COMBAT - Leadbelchers finished off the corsairs, who fled and were run down. 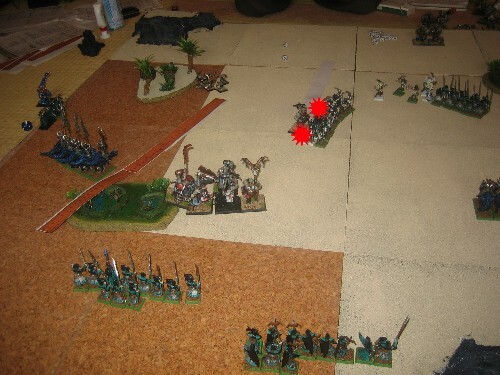 The Shades move up the table, but arent really near the action, The Witch Elves however, charge Mr Pink..
...so thats 13 attacks back I believe? Thankyou heavy armour and regeneration! D.ELVES - Trappers, Bruiser and Butcher at half wounds. A great game, that on turn 3 looked like it was in the bag for Adam, almost all my troops were dead or running, but the survivability of my generals unit (5 strong, 3 guts 1 butcher and a Bruiser, regeneration, and magic resistence) allowed me to get back into the game, a lucky streak with getting the crossbowmen (inc bsb and mage) and the spearmen (also with mage) to flee off the board. helped swing it in my favour. Well, Good Game Adam! May the Druchii redeem themselves at our next meeting! As the dust settled and the last of the storm was rustling the tattered Elven banners, Boglab and Flubbergut sat under the smoke blackened palms, picking bits of Elf from between their teeth. Even the Gnoblars were rejoicing, their masters wouldnt notice them for a while, not with all this free meat lying about. It would not be long before he sent out scouts to check on the beached ship, who knew what trinkets he might find aboard? And if he were lucky, maybe even some more of these tender elven snacks. 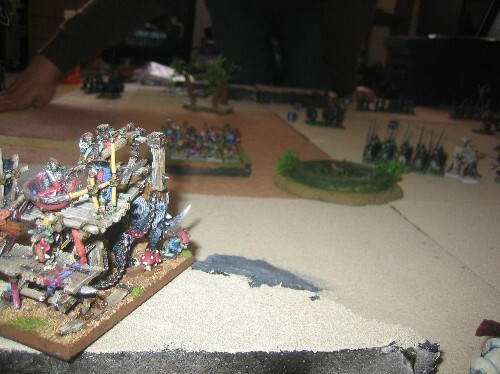 While the Ogres savoured their victory Miraguel lead the bulk of his forces towards the ogre's encampment. . .